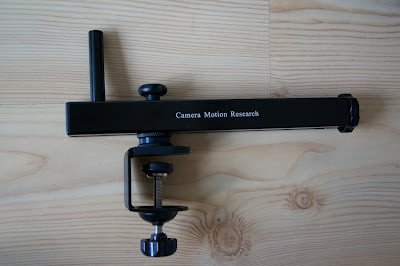 A few days ago I was asked by Camera Motion Research if I would like to try out their Blackbird Camera Stabilizer. A fantastic offer I just couldn't refuse, being the camera stabilizer fanatic that I am! And before I knew it, UPS came to my door and delivered the Blackbird. When I unboxed everything, I saw a nice looking custom case. You get the case standard with the Blackbird Full Kit, but it can also be purchased separately. Thanks to the foam padding, all components are safely stored inside the soft carrying case. 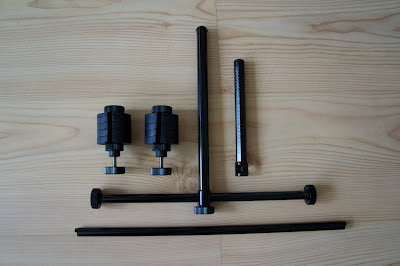 I received the Blackbird Full Kit to review and also received the optional Short Vertical Bar which makes the Blackbird more compact when being used, and enables you to balance even smaller cameras (down to .5 lb). When unpacking everything I was immediately very impressed with what I saw. Everything is well thought out with a lot of attention to detail. For example, the weights are very nicely packed and held together with two counterweight holders. Even the camera mounting plate has a bit of rubber on top to prevent unwanted slipping of your camera when using a single screw. There's even a very handy "pan only" control ring below the gimbal. No matter how you hold the handle, this ring alway's works and creates a nice pan movement. Camera Motion Research has done something unique with their stabilizer. They designed a gimbal with adjustable friction. Why is this so special? 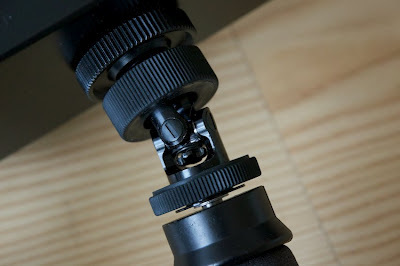 Normally you would want the lowest possible friction to isolate your hand movements from the stabilizer and camera. The 6 precision ball bearings gimbal of the Blackbird is very low friction and works absolutely great, but having a low gimbal friction comes with a price: you lose control over camera motion and it takes skill to be able to control the camera, without using too much force on the operator control ring. When you're a beginner learning to fly a stabilizer you'll find that controlling the camera is one of the most difficult things to master. That's where the adjustable friction (SmoothTouch technology) comes into play. You dial in the amount of friction you need on the gimbal and start flying like you normally would, but with more control over the roll and tilt motion of the camera! And even if you're an experienced operator you always have one enemy when working with a stabilizer: wind! We can't control the weather and when you need to shoot on a windy day, your camera on a stabilizer will react like an wind indicator. So wether you're a beginner who starts learning to fly a stabilizer or you're an experienced user who needs to work on a windy day, you can use the SmoothTouch function. Although I had my doubts at first about using SmoothTouch, it's actually one of the most clever and helpful things about the Blackbird. I was filming on a very windy day, but didn't want to use the SmoothTouch because I just wanted to show what the Blackbird was capable of with the gimbal at the lowest possible friction. There are a lot of videos online showing footage captured with the use of SmoothTouch but only very little show how smooth the Blackbird can actually fly. That's why I decided to not use SmoothTouch on any of the shots you see in the videos below. However, I did try it out and was curious to see the resulting footage later that day. Although I was a bit reluctant at first, I was amazed by the performance of the Blackbird with the use of SmoothTouch. Next time I'll find myself filming on a windy day I'll be using SmoothTouch for sure! 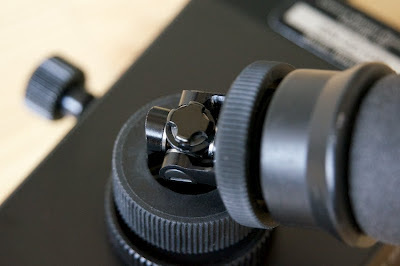 One of the accessories I like the most, is the Universal Docking Bracket. Easily overlooked but so important when balancing your camera or for having a place to dock the stabilizer with camera still attached to it. What's so nice about it, is that you don't have to mount it on a light stand, like you normally would. No, this docking bracket can also be mounted on your tripod and even on a table or desk thanks to the table clamp! It's the little things like this that makes me really appreciate the Blackbird. It's convenience all the way through. Trying to find a good balance for your camera on the Blackbird is very easy thanks to the location of the weights on the T-bar, that can be quickly moved up and down, to get the right drop time (about 1.5 to 2.5 seconds). Another thing that makes balancing a breeze is the camera stage. It only has two adjustment knobs for precise x-y positioning of the camera. One for the side to side and one for the front to back adjustment. And that's it! There's a lot of room to move your camera around on the camera stage to place the center of gravity of your camera, right above the gimbal. A safety pin prevents the camera from sliding off the stage while making adjustments. After reading the manual and looking at the DVD, it only took me about a minute or so to get the camera balanced. Although, I must add that I'm used to balancing stabilizers, so I might not be a good reference point. But thanks to the clever design of the Blackbird and the clear manual I think it will be an easy process for every user. If you still need help, you can also find a very good Balancing Tutorial (video) on the manufacturer website. When you order the Full Kit you also receive a resting stand for your BlackBird, or as some people call it: the kickstand. This enables you to put the camera on the ground (or any other surface) between shots to take a short break from flying. When I was filming, I often used this handy accessory. The location I chose to try out the Blackbird and make a demonstration video was the Botanic Gardens of Utrecht University. An unique and beautiful garden with thousands of plant species, situated at Fort Hoofddijk in the city of Utrecht. It was a very windy day so I had to wait a few times before I was able to get my shots. Nevertheless the Blackbird did a fantastic job stabilizing the camera and I was very pleased with the resulting footage. Next time I will definitely be using the SmoothTouch feature to have more control over the camera in these windy conditions. Here you can see the Blackbird stabilizer in action, and below that the resulting video. The camera I'm using on the Blackbird in this demonstration video, is the Sony NEX-FS100 Super 35mm Sensor Camcorder with E-mount 16mm pancake lens and VCL-ECU1 wide angle conversion lens. To keep the camera as light as possible. All the 'behind the scenes' shots, were captured with the Sony Alpha NEX-5N digital camera with 18-55mm lens, which I also used to take the pictures you'll see on this page. When you buy the 'Blackbird Basic' ($469.95) You will receive the Blackbird Stabilizer, including the camera mounting plate, gimbal extender, 11 inch and 15 inch horizontal tubes, spare screws, user manual and instructional DVD. 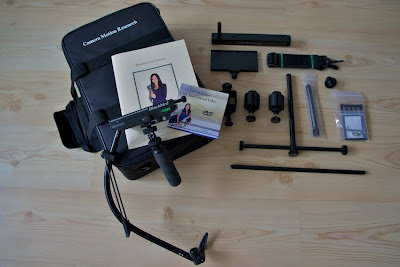 The 'Blackbird Full Kit' ($669.95), which I'm reviewing now, includes everything from the 'Blackbird Basic' plus custom soft carrying case, resting stand (kickstand), universal docking bracket with table clamp and a tripod adaptor. All of these items can also be purchased separately. 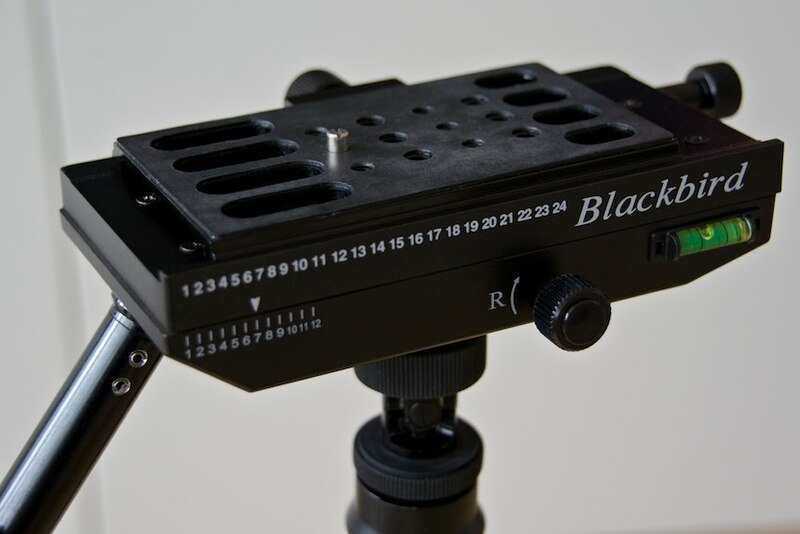 The 'Blackbird Basic' gives you everything you'll need to start flying your camera straight away. But the accessories you receive with the Full Kit are very valuable to have. If you have the money, I would suggest to buy the Full Kit straight away. Of course you can buy the Basic version first and add accessories later in time, but you'll definitely want these items and you can save a few dollars when you buy the Full Kit. If you can't afford the Full Kit, I would like to suggest to start with the Basic plus the Universal Docking Bracket ($54.95). 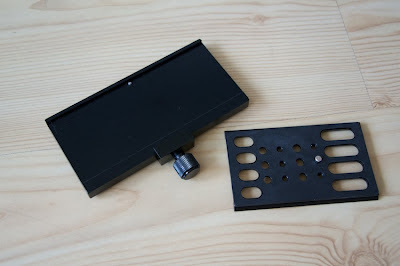 The docking bracket will help you carry the weight while you try to balance your camera on the Blackbird and it's also a good place to store your Blackbird with camera on top. 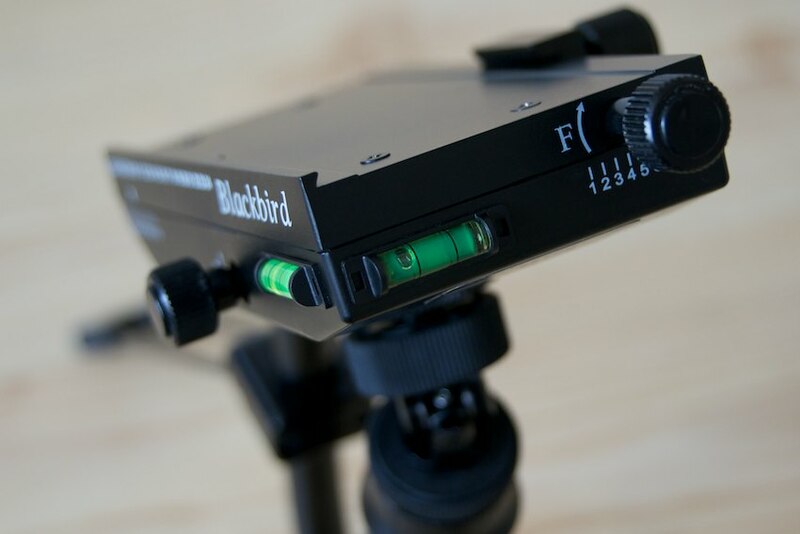 Second must have item is the 'Blackbird Resting Stand' ($64.95) which will enable you to rest the Blackbird with camera attached in between shots. 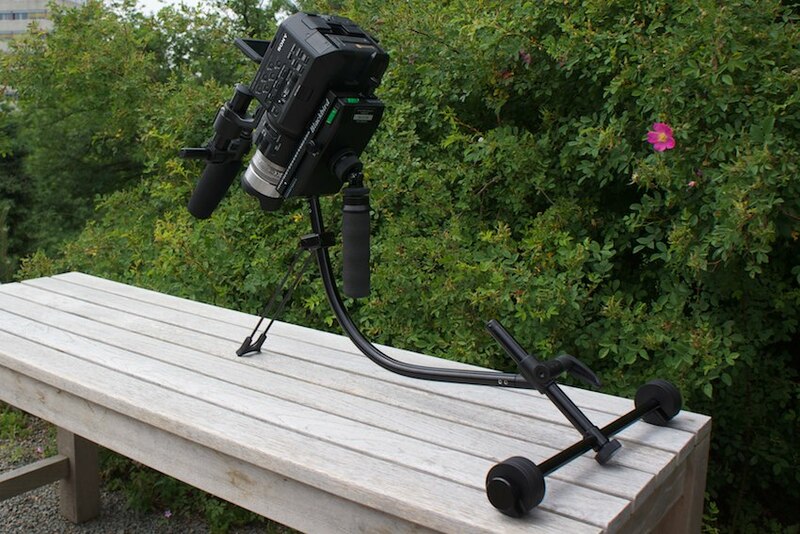 The Blackbird is a fantastic stabilizer which I found an absolute joy to work with. Balancing it was fast and easy. Having the weight of the camera directly above your hand, helps to carry the weight more easily and also enables you to hold it for a longer period of time. Having the weights placed far below the camera and apart from each other gives the stabilizer more inertia and helps in eliminating rolling shots. The accessories are a must have and greatly enhance the shooting experience. And that's what I like most about this product: it's not just about the stabilizer, but it's taking it to the next level and thinking about the shooting experience! The Blackbird oozes out convenience with a great amount of attention to details. No matter what your operator skill level is, the Blackbird will suit your needs. 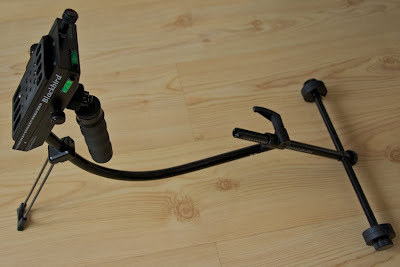 You can also use the Blackbird directly on the Steadicam arm & vest. I already tried flying the Blackbird on the Steadicam Merlin arm and vest, and it works great together! They also developed an accessory (Z-post) that provides more clearance between the arm and stabilizer. No negatives? Well, the Blackbird is a larger stabilizer then some of it's competitors. I'm sure some people would like to have a smaller stabilizer they can more easily take with them in their camera bag. For me personal, this is not a problem. 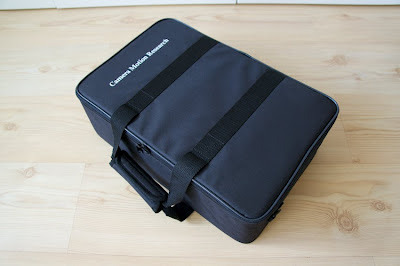 It's compact when packed in it's custom case and having a larger stabilizer (but not heavier!) gives you more inertia and better control over the stabilizer. If you're still uncertain wether or not to buy one, you can even rent a Blackbird stabilizer from CMR and try it out for yourself. But I have to warn you: when you'll try one you want to buy one! Great post, thank you for your detailed introduction to Blackbird Full Kit, but it is too expensive.